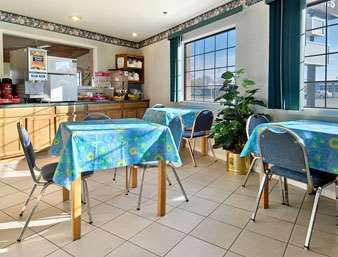 The Rodeway Inn and Suites hotel in Guymon, OK near Sunset Lake at Thompson Park offers a good night at a great savings. Our pet-friendly location off Highway 54 makes it easy to visit attractions like Sunset Hills Golf Course, Guymon Community Theatre, All Fired Up Arts Center and Gallery and Oklahoma Panhandle State University. Stay on budget with amenities like free continental breakfast, free WiFi, an exercise room, indoor heated pool and guest laundry facilities. Your fresh, clean room offers reasonable amenities like a coffee maker, microwave, refrigerator and desk. Some rooms feature a sofa sleeper. Earn rewards with every stay with our Choice Privileges Rewards program. Pets Allowed 10.00 USD per pet, per night. Max 2 pets per room.